Because he has cute little quirky habits! OMG, because he is adorable!!! Because he has awesome hair! Because he amor THE CAKE!!!!! L is just awesome, period. It's impossible to pick one thing!!! 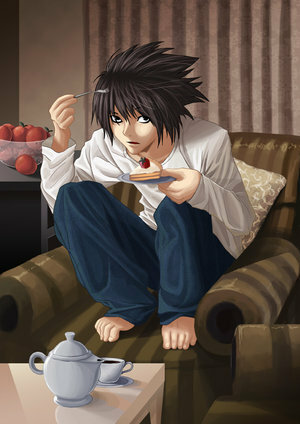 Just, how can you NOT love L?!?!? I love him because he TOTALLY shocks you about EVERYTHING!!! And, I tried making a list once of stuff that made L really really cool, but, you know! 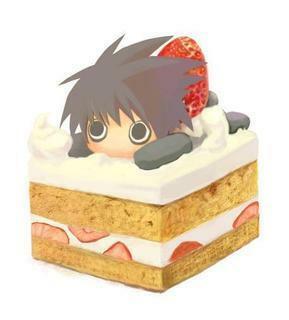 He's L! You can't just make a list!!! So, as you can imagine, my list failed. LOL! That doesn't make him any less cool, though!! LOL! He was my favorite character before I even started watching the show (or reading the manga). It's kinda a combo between his looks, his eating sweets habits, and his eccentricities. AND 5:THE SMARTEST SWEET LOVER IVE EVER SEEN!!! OH AND 6:HE'S FULL OF THE SUGAR HE EATS!!!!!!!!! y wouldnt i luv him? 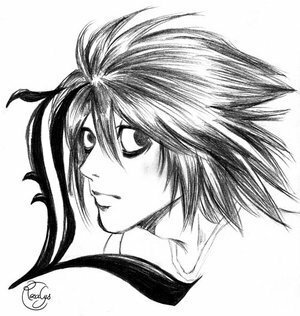 there's no other way to describe it, other than L is L!all of those quirky tendencies come with being L, so no one can be L exept for him, that's why he's him! no other explanation exept for that. I remember seeing pictures of him and thinking he's cute. Then I saw the anime and loved his quirks and immediately became my favorite. As the series went on I got more and more attached! 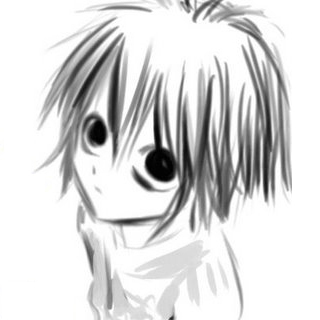 I love every detail about L Lawliet, not just one specific one. I wouldn't change a thing. L is L. i would never love him so frickin much if it wasnt that i love everything about him. the end. OMG JUST EVERYTHING ABOUT HIM!!!! Would L become a D.C hero or Marvel hero?